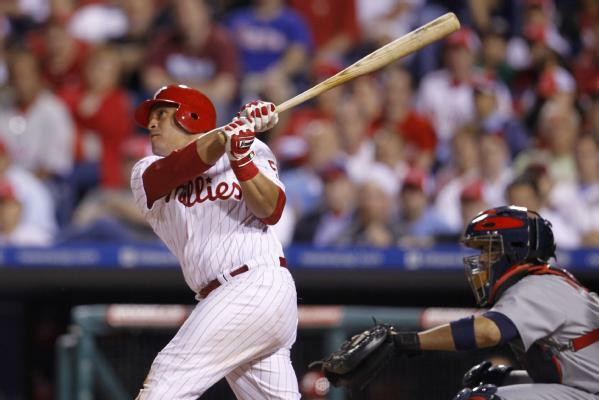 By now, you've heard about the drug suspension imposed upon Phillies catcher Carlos Ruiz earlier this week. Following a second positive test for amphetamines, the 33-year-old Panama native will miss the first 25 games of the 2013 regular season. Following the news, Ruiz issued a statement to apologize to his team as well as the fans. The Phillies also went public, stating that they were disappointed, but would continue to support their player. Both of those are typical and were expected. Also a sure thing are Philadelphia baseball fans' reactions to Ruiz upon his return. The man they call "Chooch" is an individual that has accomplished a great amount while wearing Phils' red. The "home grown" player has caught no-hitters. He has become an All-Star. He helped lock down a World Series championship and five consecutive division titles. Philly faithful will absolutely continue to have their guy's back when he gets back on the field. Not too long ago, reliever J.C. Romero, who notched two wins in the 2008 World Series for the Phillies, consumed a banned substance in the form of a supplement purchased from a vitamin chain store, due to an oversight by the manufacturer. He was subsequently suspended for 50 games. Upon his return, fans happily welcomed Romero back. But, as quickly as Romero became a solid bullpen arm, his production fell off and the adoration of the Citizens Bank Park crowds was no longer there. Romero became just another guy who took something he wasn't supposed to and had some success with it. While Romero came and went, he's no Chooch, who was probably a guy that could never do any wrong in the eyes of Phillies fans. Fans will swoon in late April when Ruiz suits up to play. There is no question about that. But what about when the day comes that Ruiz is done being an excellent on-field contributor? On a recent edition of the PhoulBallz Minor League Podcast, I asserted how strongly I felt about Ruiz's place in organization history, stating that "Chooch is going to be on that Phillies Wall of Fame one day and it's going to be one of the most deserving guys ever." I added, "Aside from the guys that are in the (Baseball) Hall of Fame, like Whitey Ashburn and Mike Schmidt, Grover Cleveland Alexander, I think Chooch is going to be one of the most deserving guys added to that wall ever." I may need to take that back. I stand among the lifelong integrity-focused baseball fans and esteem oriented media types who assert that players who used performance enhancing drugs should not be presented with historical honors or have their names placed among the greatest of all time. Even if such a distinction is team specific, that same outlook should hold true. Adderall, the drug which presented the problem for Ruiz, is a substance that many big leaguers are granted somewhat of a pass for, as part of the Therapeutic Use Exemption in Major League Baseball's drug policy. There are many dozens of big leaguers currently using the drug. Ruiz was not among those that did it legally. I fear this off-field error will be damaging to Ruiz's legacy, which previously seemed to be among the most elite in the team's history.